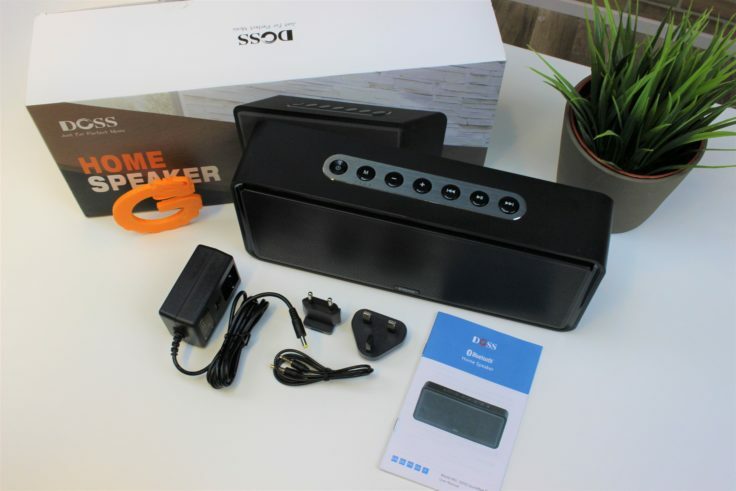 Thanks to Amazon shipping, the DOSS SoundBox XL was with us within two working days. Inside the box, next to the Bluetooth speaker itself, there is an AUX cable and an EU and UK power supply with a hollow plug. In addition, an instruction manual in German and English is included. This may adjust to the country you order from. 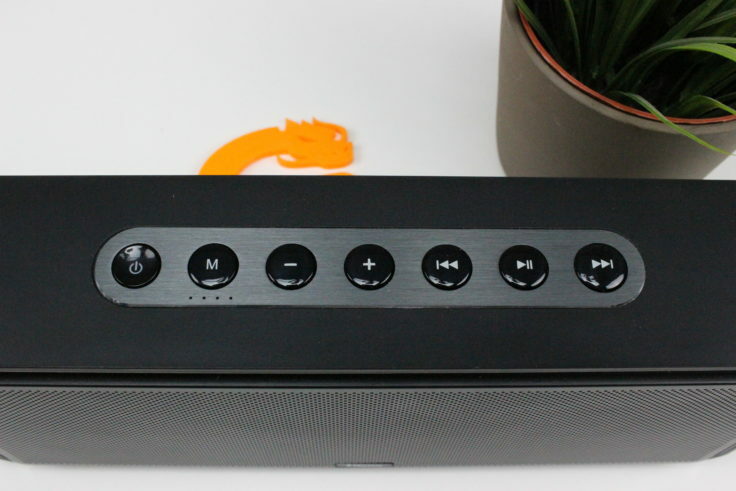 With its dimensions of 30.2 x 13.3 x 7 cm, the DOSS SoundBox XL reminds me a little of the Bose SoundLink III. With a weight of 1570 g, it is by far not a lightweight and in my opinion only suitable for travelling to a limited extent. Its appearance is simple and almost completely black. It is made almost entirely of plastic, the only difference being that metal is used for the grille in front of the loudspeakers and for a trim strip in which the control knobs are recessed. The trim on the control knobs is also the only “colour” accent, using dark grey brushed metal. The buttons themselves are made of plastic and in my opinion feel a bit cheap, but are tight and have a pleasant pressure point. All in all, the DOSS Soundbox XL is well made, but one of the two speakers we received has the metal grille slightly pressed in. This is especially visible and noticeable in unfavourable lighting conditions. Whether this damage went unnoticed during production or the speaker fell unfavourably during transport, we can’t say, of course. Thanks to shipping via Amazon, it’s easy to complain about the damage if it bothers you. There’s nothing to criticize about the second loudspeaker, presumably we just had bad luck. On the underside of the Bluetooth loudspeaker there are also four flat rubber feet. These give the DOSS SoundBox XL a non-slip stand. How does the DOSS SoundBox XL sound? Inside the DOSS SoundBox XL, two 10 Watt tweeters and mid-range loudspeakers and a 12 Watt woofer work together. In addition there are two passive radiators, sounds promising at least on paper! During the first test listening I immediately noticed that the loudspeaker is only slightly bass accentuated at a low to moderate volume. Only when the DOSS SoundBox XL is turned up properly the generally rich bass of the loudspeaker comes into its own. Why is that so? 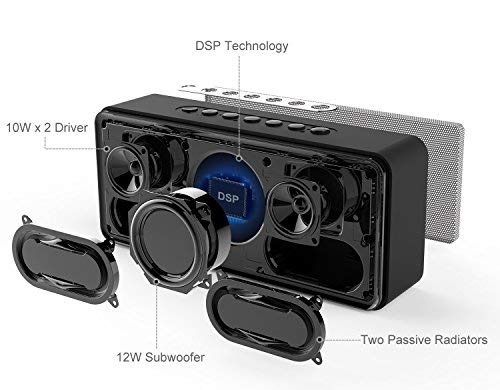 While high-priced Bluetooth speakers, due to an electronic regulation, often only become louder in the tweeter and midrange at a certain volume, many Bluetooth speakers from China tend to oversteer in this area. The reason: The production costs are naturally lower without this regulation technology. As a result, loudspeakers like the JKR KR – 1000 or the Tronsmart T6 like to overdrive at high volumes. This does not happen with the DOSS SoundBox XL at high volumes. On the other hand, the bass of the two smaller China speakers is on a par at lower volumes, even though they produce less power on paper. Thanks to modifications in the equalizer, the bass of the DOSS SoundBox XL is also solid in the low and moderate volume range. The larger DOSS SoundBox XL offers a wider and more differentiated stage than the JKR and Tronsmart T6 in the tweeter and midrange. This makes the loudspeaker suitable for use in larger rooms and areas, but with a better overall sound image, especially at high volumes. In order for you to be able to better understand the sound of the loudspeaker, I have compared it to popular JBL models. With (4.2 out of 5.0 stars) in 2539 reviews (JBL Xtreme) and (4.5 out of 5.0 stars) in 3354 reviews (JBL Charge 3) both speakers are very popular. In terms of price they are both well above the DOSS Soundbox XL; the JBL Charge 3 is currently available for $99, the JBL Xtreme for $160 at Amazon. Both JBL Xtreme and JBL Charge 3 have already been replaced by slightly improved models in the product portfolio. These are discontinued models that are already much cheaper than when they were launched on the market. The JBL Xtreme is about the same size as the Doss SoundBox XL, but the China speaker has no cuts in the comparison test. In the low-frequency range, the brand loudspeaker offers a more powerful and precise bass than the cheaper China loudspeaker. I personally like the JBL Xtreme’s tweeter and midrange tuning better. While the focus of the DOSS SoundBox XL is strongly fixed on voices and high frequencies, the sound of the JBL Xtreme is rounder for me, so that voices and high frequencies fit better into the overall concept. Compared to the much smaller but still more expensive JBL Charge 3, I like the sound of the DOSS SoundBox XL better. 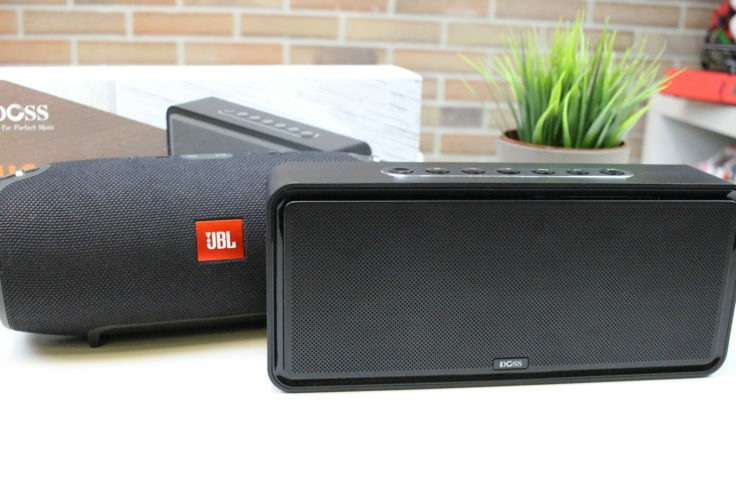 JBL’s smaller Bluetooth loudspeaker is less high-resolution than the DOSS SoundBox XL in high and mid frequencies. Small details are missing that make the sound of the JBL Charge 3 appear more compressed and flat. The JBL Charge 3 can’t keep up with the DOSS SoundBox XL even in the low frequency range, the small loudspeaker can’t reproduce low bass frequencies sensibly, there is less pressure and therefore less precise bass. The comparison test has shown that the DOSS SoundBox XL can be classified between JBL Xtreme and JBL Charge 3 in terms of sound quality. A satisfactory result, especially since the China speaker is cheaper than both Bluetooth speakers. However, you have to admit that both JBL speakers make a more robust impression, are suitable for outdoor use and have a larger battery capacity. You have to weigh up your personal usage preferences to see whether the steep surcharge for a brand loudspeaker is worth it. 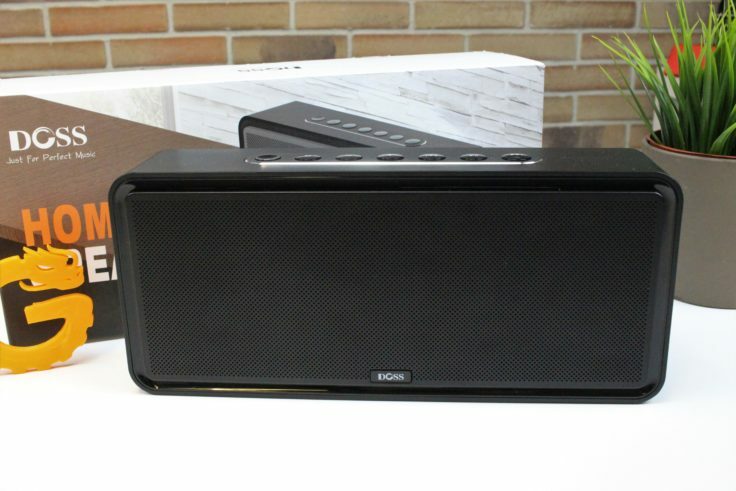 The DOSS SoundBox XL is equipped with Bluetooth 4.0 and – according to the data sheet – has a range of 10 meters. In practice I was able to confirm this value outdoors. In closed rooms it is, as always, a little less, within a room the connection between Bluetooth speaker and smartphone remains stable. If you leave the room so that massive concrete walls disturb the signal, the range drops to about 5-6 meters, an average value. The connections are located in the middle of the rear panel. In addition to Bluetooth, the DOSS SoundBox XL can also be used via a 3.5 mm jack cable. 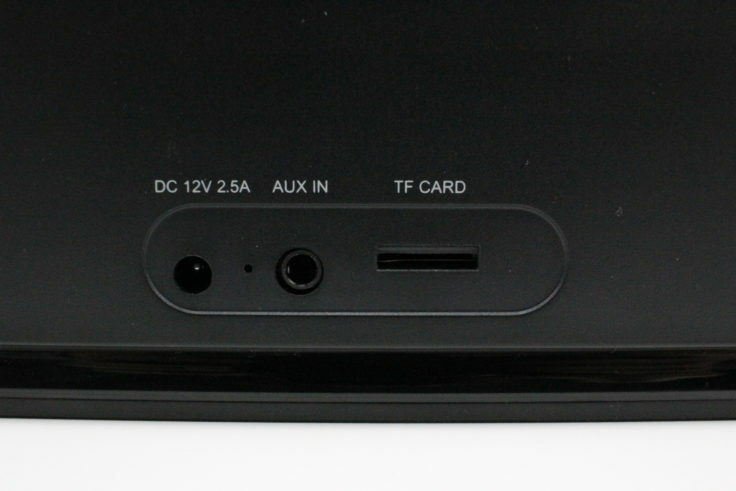 A MicroSD card slot is also built in, so the speaker can also play music without an external player – very nice! 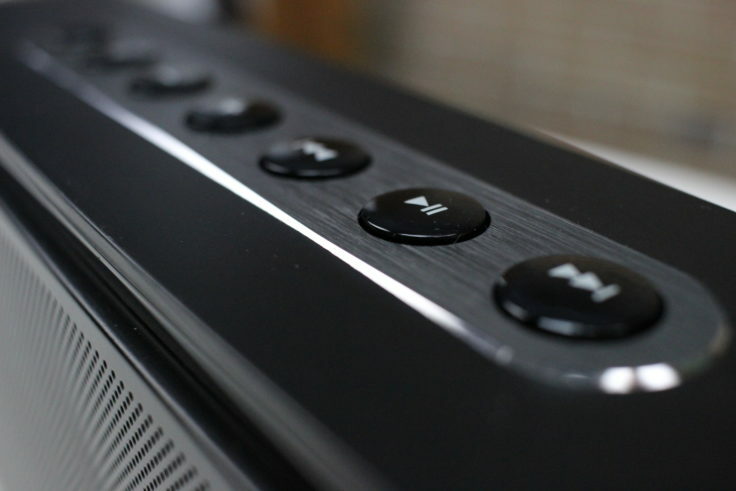 The top of the DOSS Soundbox XL features a total of seven buttons. Due to the large number, a double assignment of these buttons is not necessary. During the tests I initially thought that the buttons would not work. It turned out, however, that I intuitively didn’t press them long enough. A short tap seems not to be enough; the buttons have to be held down for about a second. Once you know how to do it, the buttons work fine. They work under iOS as well as under Android without any problems. The DOSS SoundBox XL is equipped with a 2200 mAh rechargeable battery. In the test this battery could reach a runtime of 6-8 hours (depending on the volume). Unfortunately, the Bluetooth speaker is not charged via USB, but via a hollow plug power supply. So you don’t have the possibility to charge the speaker via Powerbank in case of doubt – a pity. With the included power supply the complete charging process took about two hours. I liked the DOSS SoundBox XL a lot during the tests. The loudspeaker convinces with a solid sound, which unfortunately only reaches its full potential in the bass range at a high volume. Unfortunately, the speaker can only be recharged with a hollow plug power supply, there is no USB port. Thanks to the MicroSD card slot, the speaker can also play music without an external playback source, a nice feature that most brand models lack. 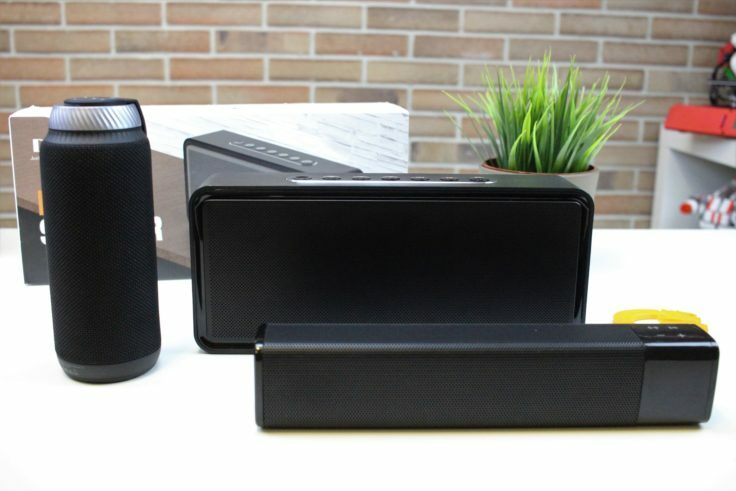 In the comparison test with JBL Charge 3 and JBL Xtreme, the DOSS SoundBox XL was able to place itself in the midfield. Although the inexpensive China loudspeaker doesn’t quite come close to the sound performance of the JBL Xtreme, it scores well compared to Charge 3. In my opinion, the regular price of about $70 is justified in terms of the price/performance ratio.